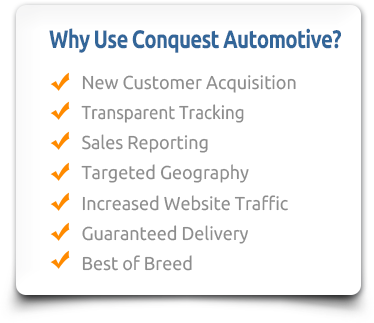 CityTwist has developed the most highly targeted Conquest Email Advertising campaigns available in the automotive marketplace. Leveraging an unsurpassed opt-in database, CityTwist identifies consumers currently in the market to purchase a vehicle, emails the dealer’s offers and incentives to "in market" consumer inboxes, and provides the dealer with full circle transparent tracking. The process is simple and easy to implement. CityTwist first scrubs its database of all consumers the dealership has a realtionship with. Then, an advertisement is created to the dealer’s specifications, and emailed to local "in market" consumers. The email generates tremendous quantity and quality of web traffic, often surpassing Autotrader, Cars.com and Facebook combined. CityTwist ensures the integrity of the dealer’s evaluation metrics. All tracking data is calculated and administered by independent third parties such as Google for website analytics, and Polk® for sales reports. For a live demo call 1 (561) 235 2990! The Fox Dealerships have been very satisfied CityTwist customers for the past two and a half years. As the Marketing Director at Fox Dealerships for the past 18 years, I would rank CityTwist as one of the best companies I have worked with. The services they provide combined with the professionalism of the staff are excellent. Most satisfying have been the results: On a $3,000 investment using their Polk E-Mail Program, we recorded 50 sales. The program data is well managed and certifiable so that we are able to determine our ROI easily. I would recommend CityTwist to any company interested in enhancing their sales. It certainly has worked for us."